The 3-star ibis Dortmund West hotel is particularly well-suited for business trips and meetings. Close to Bochum and between the InduPark and technology center. The Westfalenhallen and stadium are 3.1 miles away. The main train station is 4.9 miles away. The hotel is really noisy. One can hear what is going on with the honeymoon guests next door. Open room dors with crying people. My friends stayed there already several times but I think I will not again visit this hotel. Really good hotel which I will use again. Fine hotel for our regular shopping trips. Clean comfortable and staff fine. Usually quiet but can get noisy when the coach trippers arrive. Most annoying is the charge for parking as the car park is gigantic and never really full. I had a great experience, hotel was easy to find, great staff, great room and great breakfast. Only downside was that the shower is kinda small. I'm 186cm and was unable to stand up straight in the shower which was a bit uncomfortable. Other than that, everything was really great. Excellent hotel for value, fantastic breakfast, very good location close to motorway. Everything clean and tidy. Big room with big double bed and sofa . Quiet area, big car park. Definitely back next year. We really like your hotel as we always travel with our dog and you are dog friendly. Location is good, choice of food for breakfast is super. Staff is kind and helpful. You should check some of your pillows as they seem to be not very comfortable. Also your air-condition seems not to work properly. It is too warm in your rooms even with a window open. good hotel. Good location. Strict minimum in room. A bed, a table, a bathroom. Dont expect more. Staff is polite . Checkin very fast. We were not take breakfast but it seems that it was good.next time. Ibis Dortmund West is the best Ibis hotel I've ever stayed in. The size of the room and bathroom are exceptionally good for this class of the hotels. The bed guarantees good sleep. It is located on the outskirts of Dortmund city, which may be not excellent if you have some business there, but is really good when you are just passing Dortmund on your way and want to take a break on journey. There is good shopping centre in the walking distance from the hotel - if you like such activities. We like our stay a lot, we were very tired and we rested well. Big room with very comfortable bathroom: shower and a bathtub. Breakfast was very very tasty, a lot of varied food. We recommend the hotel. I really like Ibis hotels and accor hotels in general around the globe, but last stay in Ibis Dortmund West was not a happy experience. The room was dusty, full of hear rests under the bed is terrible. the WC was also full of dust on the corners. opposite to the WC the wardrobe was full of dust and even after I spoke to the staff about the dusty situation noting is done on this wardrobe. I told the management that my wife is allergic against house dust. The management was helpful and offered coffee and tee for us while staff cleaning the room. Last notice. on my all stay on hotels if private on businesses I have never ever heard of Bed tax (Betten Steuer) that I have been charged on Ibis Hotel Dortmund West, although my booking was 140.25 euro including VAT, I had to pay first 177.25 then when I spoke to the receptionist I got 26 euro and something back. This hidden cost I have never heard about is very strange and accor hotel management must check because it could cause big damage to the name of Accor. Many thanks for this opportunity. Quite a nice location out of town but with some nice restaurants nearby and a fast train into the City Centre and a direct link to Dusseldorf Airport. Very convenient for the football match at the Signal Iduna Park. The hotel very nice and the staff friendly. However it is very bad that it is not possible to turn off the ventilation/heating in the room. It is extremely noisy and very annoying. Why does the hotel have full heating on in May ? and why is there a thermostat in the room when this does not work ? 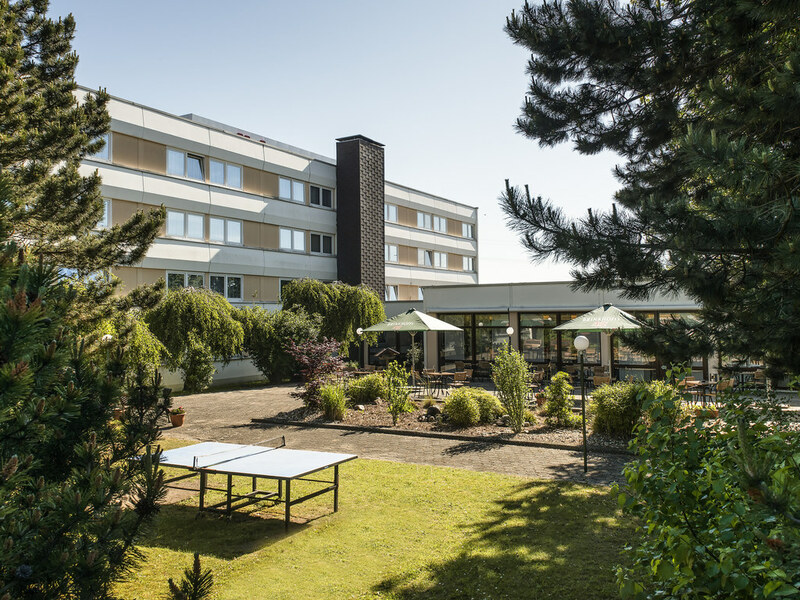 A good place but it is a litle far by the public transportation, near the Dortmund 5,9 km, excellent services, clean room and bathroom, free parking and abundant breakfast. If you intend to rent a car, this place is ideal to start visit the town and surroundings. I have slep 2 nights in a room without heating , I have asked the 1 day to change the room , they toll me , they will fix the heating systmen, when I come back to the hotel they tell me that they can not fix the heating system and that they can not give another room but they dont reduce the price for the room that is a Robbery. I WILL ADVICE TO MY COMPANY TO PUT THIS HOTEL IN THE BLACK LIST. The hotel is very smart and elegantly equipped, located in a administrative area not far away from a nice green area along the river Rhein. Rooms are very nice furnished and well equipped, service are very good, excellent WiFi connection, possibility to use the wellness center, functional parking area internal to the hotel. It's a perfect hotel for business (for tourists proboably it is located a little bit far away from the City). Unfortunately (and probably it's not a fault on the hotel's staff), I had a bad impression on the services' side and, to be precise, on the restaurant. We could take our dinner only in the bar. The service was actually excellent but this location was a little reducing the positive impression. Probably, as I said, not due to the hotel's staff but only because it was during a national Holiday, few guests in the hotel and for this reason they decided not to use the restaurant's room. I think I will try once again in next occasion anyway.